Moodabidri is a center for Jainism and is called Jain Kashi. A quiet town, 35 km from Mangalore houses 18 Jain temples or basadis. Most prominent among these is the Thousand Pillar Temple (also called Saavira Kamabada Basadi and Tribhuvana Tilaka Chudamani Basadi), situated at the center of the town. Established in 1430, this temple is an architectural wonder. The temple is dedicated to 8th theerthankara of Jains, Chandranatha. Panchaloha(made up of 5 metals) statue of Chandranatha is worshipped here by the Jains. Pillars of the temple contain some fine carvings. Episodes from the life of Jain theerthankaras, Lord Krishna, Lord Shri Rama are the subject of most of the carvings. Moodabidri was also an important trading center during 15th century. Figures of giraffe and dragon carved in the temple, provide ample proofs for that and indicate ties with Africa and China. Ceilings of the temple also have some beautiful carvings. 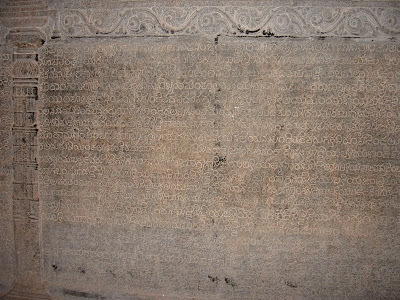 Also, one can see stone inscriptions in Halegannada (old form of Kannada). In front of the temple, there is maana sthambha which is a monolithic pillar and dhvaja sthambha, seen also in Hindu temples. Roofs of the temple which are red in colour, reminded me those of the Buddhist monasteries. 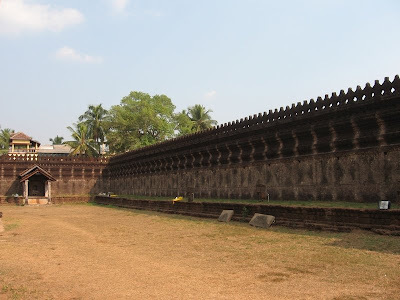 The temple is inside a fort like structure built at that time. View from the fort walls gives you the full picture of the famous temple, as you would have seen in tourist guides. The temple does not come under any Government organization and is managed by a Jain trust. They do not even charge entrance fees for the visitors. So, when I enquired about taking photographs of the place, I was asked to pay Rs.100/- as donation to the trust. One of the guides there, explained me about the history of the temple and the important carvings like Shri Rama pattabhisheka, figure of dragon and carvings made on giant doors of the temple. 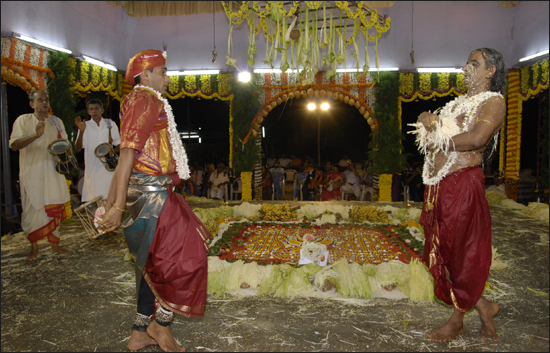 Basadis apart, Moodabidri is now famous for national level cultural festival, Alva's Viraasat, held every year. This music and dance festival brings together the best of artists from all over India. Moodabidri is also close to other tourist destinations like Karkala (another center for Jainism, 18km), Dharmasthala (Hindu pilgrimage center, 50km) and Udupi(50km). With its serene surroundings and charming presence of the Thousand Pillar Temple, town of Moodabidri beckoned me for a second visit to the place. When I was there an year ago someone in the temple insisted I shouldn't take photographs inside.. He He... Yes Nidhi, More posts from me. Also, there was board in Thousand Pillar temple not to take photographs. But after enquiring, they allowed me. ಈರ್‍ ಕಂಡಾಪಟ್ಟೆ tour ಮಲ್ಪುವರ್ ಮಾರ್ರೆ ! !